HANOI (Viet Nâm News) – Vietnam Government was willing to create the most favourable conditions for Kazakh enterprises to do business in the country, Deputy Prime Minister Vu Van Ninh told a business conference yesterday. 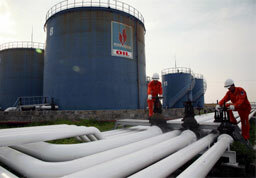 PetroVietnam is the trading name of Vietnam Oil and Gas Group (PVN). It was established in 1977, and its activities, through its various companies and wholly owned subsidiaries, now cover all the operations from oil and gas exploration and production to storage, processing, transportation, distribution and services. Wholly owned by the Vietnamese central government, it is responsible for all oil and gas resources in the country and has become its country’s largest oil producer and second-largest power producer. PetroVietnam also carries out exploration activities in Malaysia, Indonesia, Mongolia and Algeria, and recovers oil in Iraq and Malaysia. Penetrating Vietnam, a market with approximately 90 million consumers, Kazakh businesses would also have the opportunity to access other large Southeast Asian markets, the deputy PM said. However, bilateral relations between the two countries, especially in trade and investment, were yet to match the potential and desires of the two countries, he noted. He called on businesses to seek new co-operation opportunities in a move to further develop the two nations’ relationship. Kazakhstan had paid great attention to cementing relations with Southeast Asian countries, including Vietnam, said Kazakh Deputy PM Asset Issekeshev. He outlined oil and gas, mining, textiles and garments, agriculture, transport and tourism as promising sectors for future bilateral co-operation between the two business communities. Businesses would play a leading role in raising the level of economic and commercial ties between the two countries, said the Vietnam Chamber of Commerce and Industry vice chairman Vu Tien Loc. The Vietnam-Kazakhstan Business Council, which was also launched yesterday, would help businesses exchange information and form reliable trade partners as well as explore opportunities for co-operation on trade and investment, Loc said. Two-way trade reached a modest US $44 million last year and $26.3 million in the first eight months of this year, but Kazakhstan does not have any investment projects in Vietnam. Yesterday’s forum witnessed a memorandum of understanding inked between PetroVietnam and the Kusto Group of Kazakhstan. The MoU would facilitate the two companies’ co-operation in exploring and exploiting oil and gas in Viet Nam, Kazakhstan and other countries. During the event, Vietnam’s Astana Thai Son Co also signed a contract in-principle with Satra Thai Son Joint Stock Co. Under the contract, the two companies would join hands in exporting agricultural and seafood products to Kazakhstan.